On 28 November 2017, I officially became a Dutch citizen. I’d been an Amsterdammer for 12 years, but I was always labelled an expat. Then Brexit happened and I felt more European than ever. (And believe me, I’ve always felt pretty European: at age 11, I broke my classmate’s Union Jack flag in protest about something or other. I was a weird kid.) It was all the sign that I needed to take the next step towards my adopted nation. The application process took the best part of a year (mostly because the government loves to have meetings to tell you about the next meeting, and send letters to tell you you’ll receive a letter) but it was pretty much an open and shut case for someone in my position. I spoke the language, had the diploma to prove it, and had been a fully paid-up member of Dutch society for over a decade. But it’s not every day that you change nationality. My parents came over for my Dutch naturalisation ceremony (glad to get shot of me finally?!) and listened patiently while I was the only one who knew what the ambtenaar was going on about. We didn’t have to pledge allegiance to the King; nor did we have to swear anything relating to God or the Bible – both of which I was relieved about (not being much of a Christian monarchist myself). What we did have to promise, however, was to respect the laws and freedoms of the Netherlands, and to respect our fellow citizens – whatever creed, colour or sexual preference. And that’s something I can get on board with. After the ceremony, we popped across from the Stadhuis to the highly Dutch Café ‘t Hooischip, where we drank bockbier and ate kaas blokjes. My friends gave me an Andre Hazes CD, and my husband presented me with orange flowers. I was blushing with patriotic pride. It felt entirely fitting with my national status, then, that Guts & Glory was midway through its “Dutch Chapter” when I was looking for a suitable restaurant in the vicinity for dinner that night. They change tack completely every three months, and previous chapters have ranged from making a menu out of an entire animal to transporting diners to Spain (not literally). I’d never experienced any of their chapters before, but had heard good things about them, so I leapt on the chance to eat Dutch food from the people who brought us Breda (one of my favourite restaurants in Amsterdam). 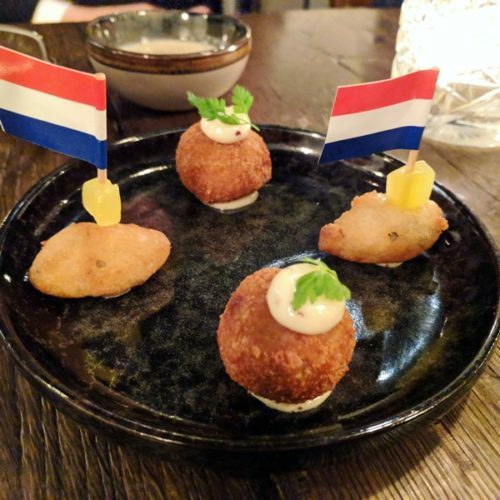 We all opted for the five-course menu for €49.50 (you could also get a six- or seven-course menu for €57 and €64.50 respectively) and tucked into these Dutch flag-waving amuses bouches (above): snert bitterballen were excellent, not least because their contents had been lightly smoked. There was also a cup of creamy mustard soup and a deep-fried ball of something that reminded me of a savoury appelflap. 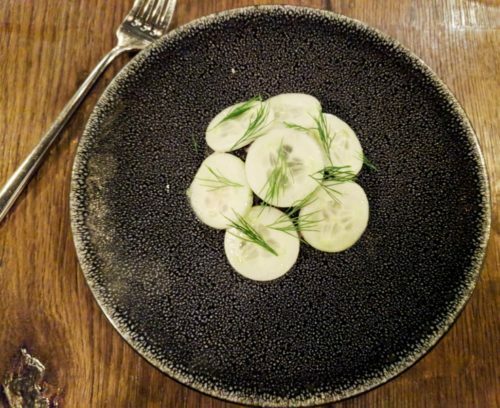 Our first “real” course was a salad of raw herring, cucumber, dill, horseradish cream and herring caviar – it was perfectly fresh and tasted almost Nordic in tone. Our second course was a slightly smoky leek broth – it was rather similar in flavour profile to some of the other dishes and wasn’t a huge hit with us. Next up came Brussels sprouts done in three ways (one of which was BBQ-ed, I think!) with extremely finely sliced shallots (so fine that my usually onion-hating Dad ate them all without noticing) and a Dutch-style beurre blanc. The latter was heavy in vinegar but cut through the creaminess and vegetal sprouts perfectly. This was hands-down my favourite dish. Our meat course was wild hare cooked in two different ways: the first was blood-rare with beetroot sauce; the second was in a rich game pie with a potato crust. For me the dish was missing something, but perhaps that’s because the portion size was rather small. 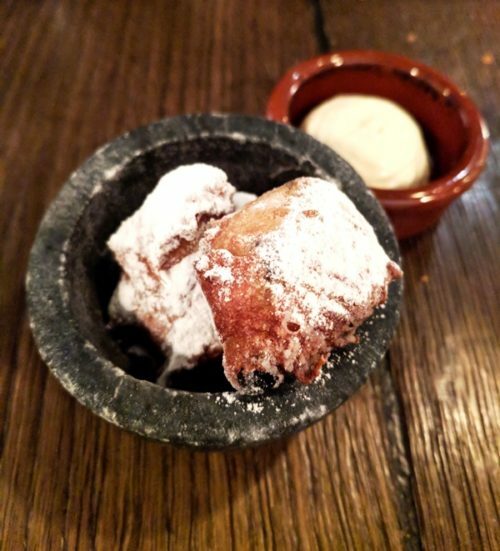 As a sort of pre-dessert, we were presented with mini krentebollen dusted with icing sugar and dipped in fennel-seed cream. Definitely better than the local gebakkraam, but at the end of the day still a glorified oliebol. Our final course comprised boerenjongens (golden raisins soaked in brandy) with salted caramel, ice cream and a chocolate crumb. At least, I think that’s what I was eating: by this point I’d had two bockbiers, a glass of Dutch sparkling white, and several glasses of wine, so my memory isn’t up to much. My expectations of Guts & Glory had been high because of the Breda connection, so perhaps that’s why I was a little disappointed that standards weren’t as high as I’d hoped. 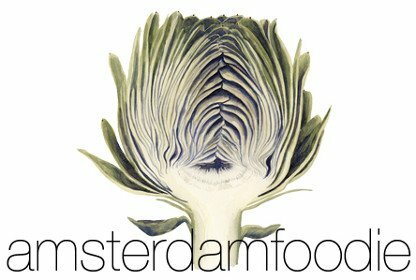 Or perhaps (burn me as a heretic in my first week as a Dutch woman) it’s just that Dutch food by itself isn’t enough to carry a fine-dining concept. In this case, I’m prepared to give Guts & Glory a second chance and go back for another meal once the menu has changed again. I suggest you wait a few weeks and do the same.